The aim of this Programme is to provide students with the essential knowledge and skills for starting and managing new ventures and entrepreneurial organisations. It is designed as an excellent study pathway for people who wish to start and manage their own business, to undertake an entrepreneurial role in large organisations, small to medium sized enterprises (SMEs) and to support the development of start-ups in the dynamic business environment. The Programme will also provide a solid foundation for those who want to pursue research in the fields of business, management and entrepreneurship. A strong focus on experiential and authentic learning for students to acquire first-hand experience on how entrepreneurs and business executives make decisions in the real life context. An emphasis on the development of a range of generic competencies such as creative thinking, decision making, interpersonal communication and team work, which are much needed in the dynamic business context nowadays. A unique MSc Project which can be adapted into different formats including a company-based project, an extended business start-up plan, or a traditional dissertation to match with individual career aspirations. Complementary learning activities offered by the Wu Jieh Yee Centre for Innovation and Entrepreneurship, which features a pre-incubation programme, seed funding, start-up mentorship as well as various networking events. Both full-time and part-time modes of study are available. Students are normally expected to complete the Programme in one year in full-time study mode or two years in part-time study mode respectively. Classes may be scheduled during weekday evenings and Saturday afternoons or as intensive study blocks during weekdays. Fulfilment of one of the following English language proficiency requirements if the applicant’s bachelor degree was not obtained from a university where English is the medium of instruction: TOEFL ≥ 550 (paper-based), ≥ 213 (computer-based), ≥ 79 (internet-based); IELTS ≥ 6.5; CET 6 ≥ 430; TEM-4 ≥ 70. 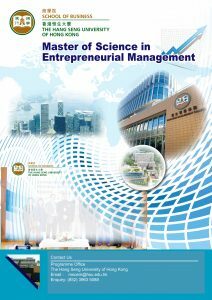 Master of Science in Entrepreneurial Management is recognized under the Qualifications Framework (QF).